I don’t want to deceive my readers; this is a close up and the apples look much bigger than they really are! They are really about the size of small walnuts. 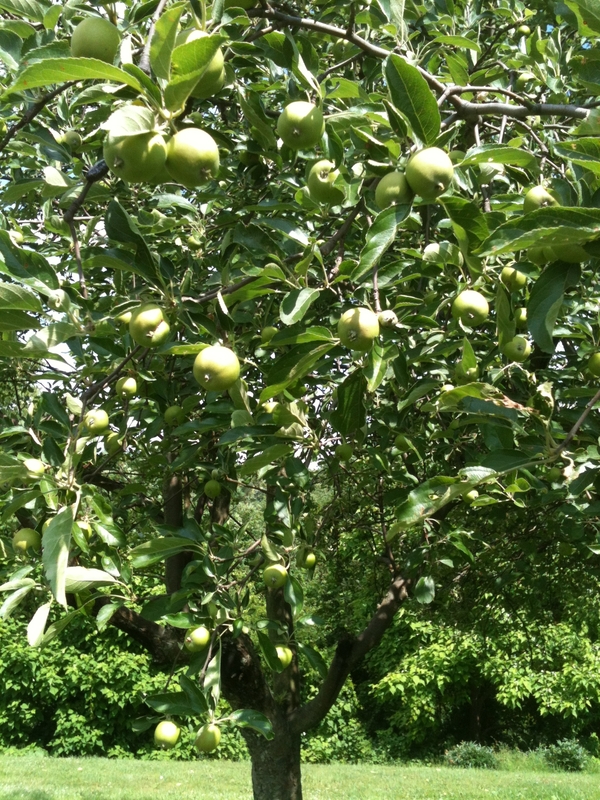 There haven’t been any new fruit trees planted at Apple Hill Cottage for many, many years. Two old apple trees that really need to be pruned overlook the hillside. This spring we were too late to prune them–they had already bloomed by the time we got to thinking about pruning. Our neighbors have many fruit trees dotted over their yard, and he told Michael that those old trees still get apples on them. So one morning about 6 weeks ago we cleaned them up. Cut out the dead limbs and the branches that had tent worms; cut off the extra long suckers that we could reach and then burned the tent worm cocoons in kerosene. Michael cut up the limbs into little pieces and now he has an endless supply of apple wood chips for grilling. We dragged the rest of the limbs over to our fire circle and had a lovely bonfire that early spring night. Now, six weeks later, they both do have apples on them–very small, but we’re hopeful. Over Memorial Day weekend, on our way out the road and back to Pittsburgh, we stopped at the new business where the main barns of the orchard used to be. First it was Longanecker’s Fruit Farm, then it was Little Greene Apples; now it is Mother Earth Farm and Greenhouse Outlet. We spent awhile poking around in the barns and talking to the nice folks who run it. They have all sorts of nursery plants, veggies, flowers, and they sell antiques and pottery also. The potter was at her wheel making lovely little vases. 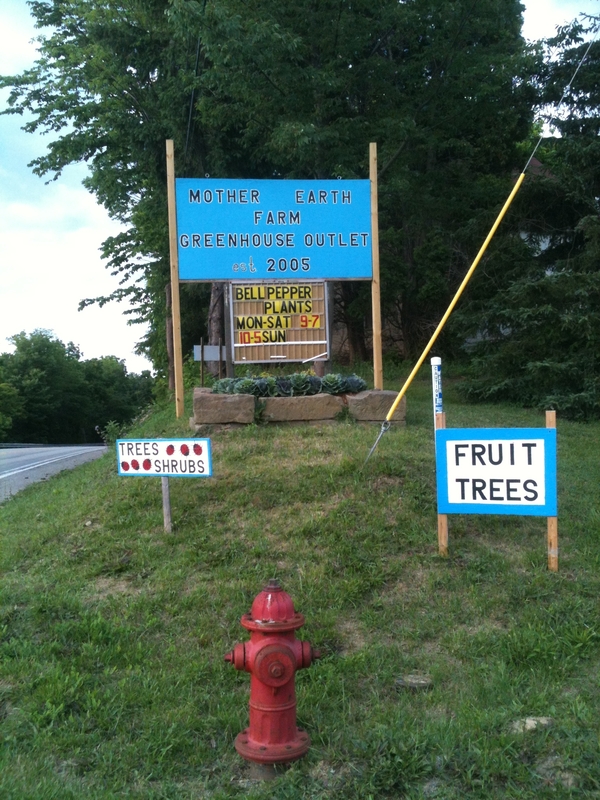 And they sell fruit trees! 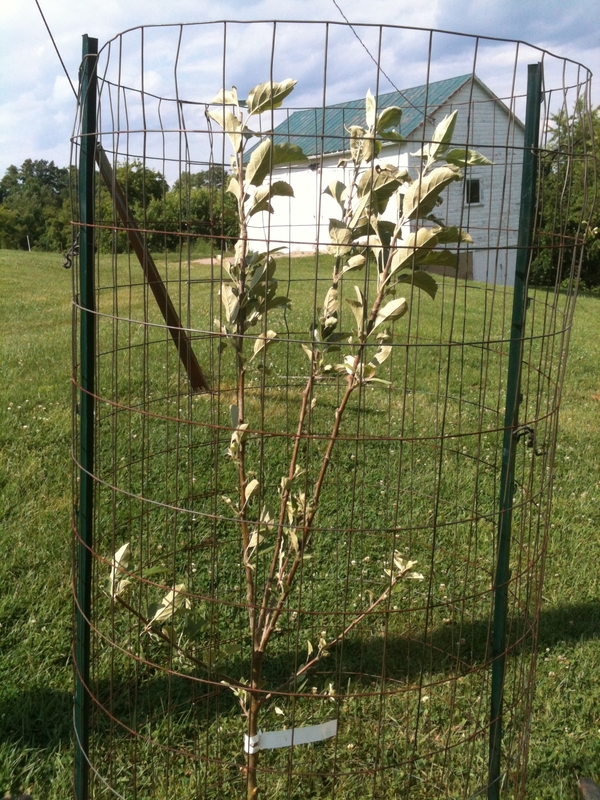 How wonderful to be able to buy fruit trees in the place that used to sell apples. How could we resist? 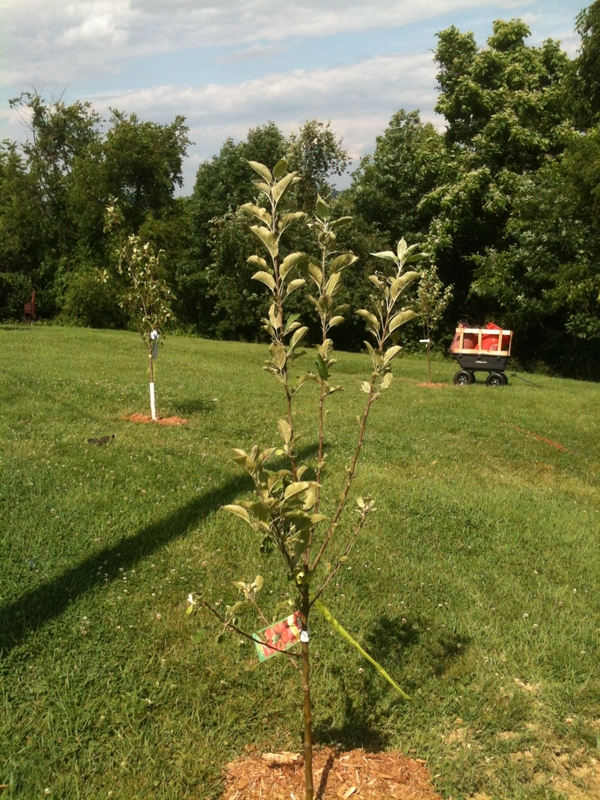 We bought two apple trees–an Ida Red and a Honey Crisp–and two pear trees–a Bartlett and a variety called Luscious. Then, of course, we had to have a cart for the tractor to pull them home. 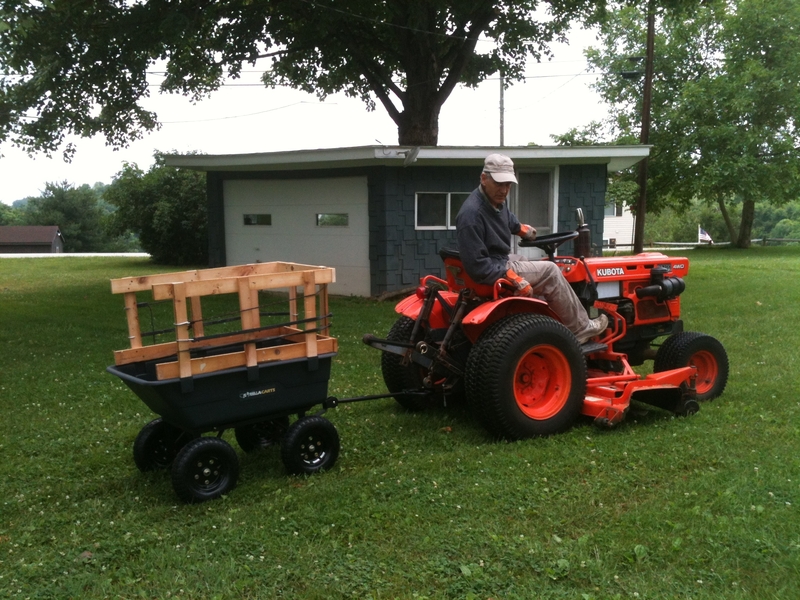 (We’d been planning to get a garden cart anyway, for gardening and pulling around grandkids!) And we planned to spend a whole day the next weekend planting them. The next Saturday was a beautiful day. 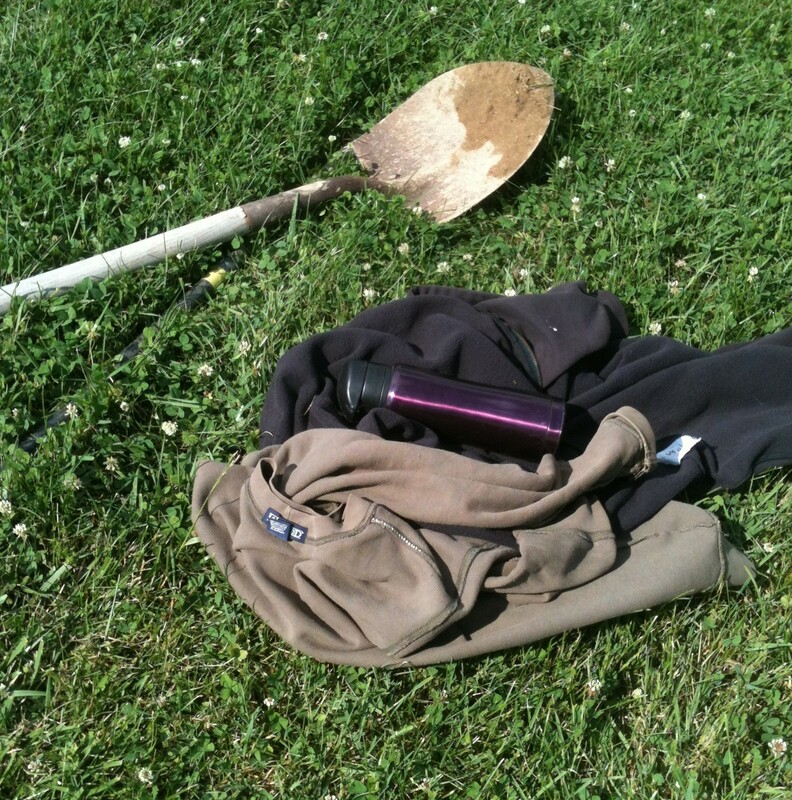 Sunny and in the sixties–more like a day in April than June, but it was perfect for planting trees. Michael found wood to make the cart taller, hooked up the cart to the tractor, and went driving down the road to get the trees. Michael fretted a bit about not having a big orange triangle for the back of the cart, but I told him he didn’t need one, his tractor was very visible! Clara would have loved the color. 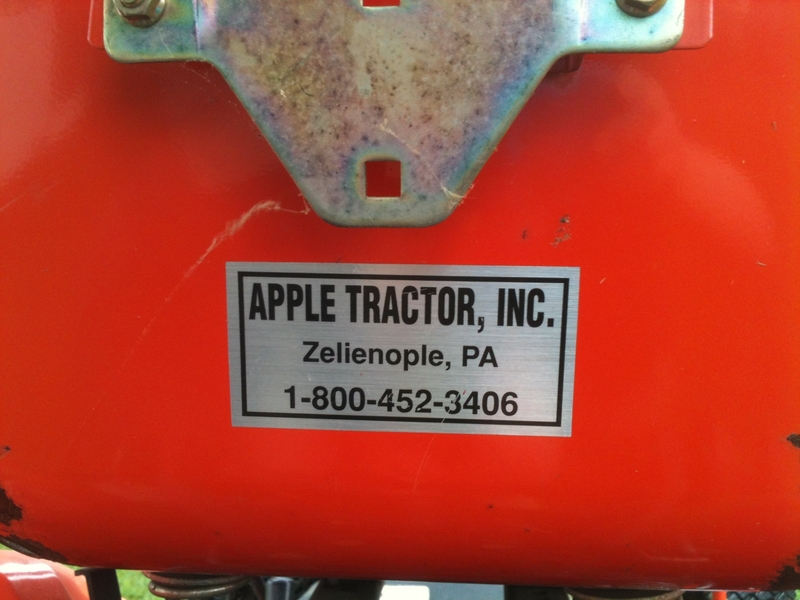 The tractor originally came from Apple Tractor, Inc. in Zelienople. Very perfect! Even though the temperature was in the high sixties, the sweatshirts came off very soon. 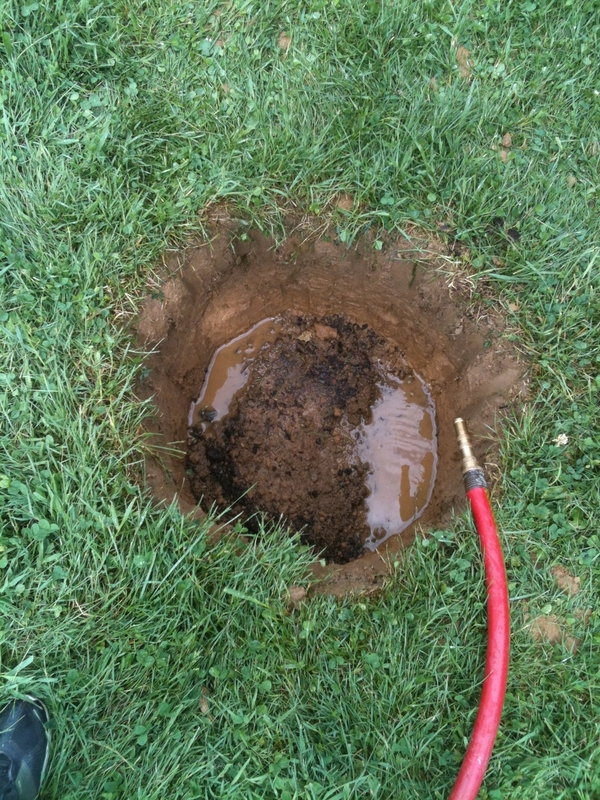 While Michael was having fun on the tractor, I started digging holes. There are no pictures of me working at all, but believe me, I did. The holes for an apple tree have to be twice as wide as the root ball and 10 inches deeper. They were big holes. Michael dug perfect holes. Mine were less than perfect, but we sweated the same amount! One of Michael’s perfectly dug holes. It was a full day’s work planting these four little trees! Up at 6 AM and in bed before dark—with red necks, aching backs, and a lovely sense of the circles of life. 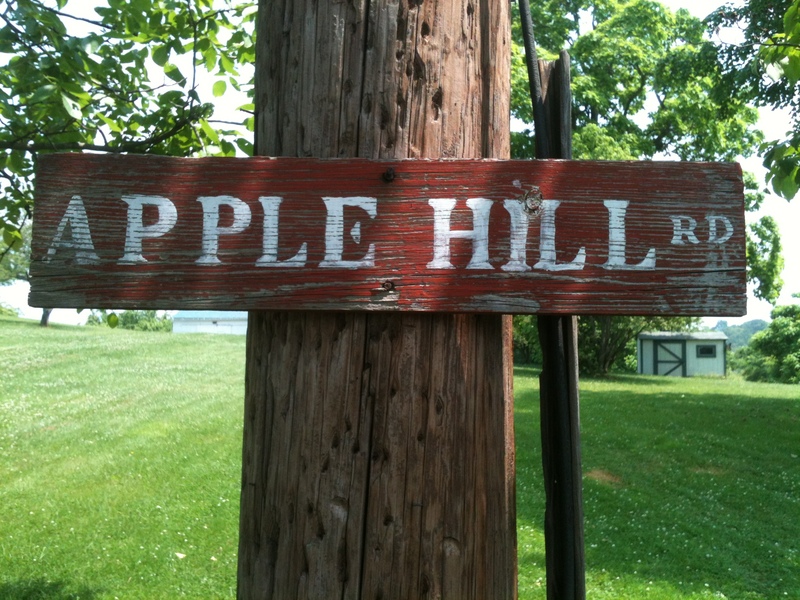 There are new apple trees again at Apple Hill. 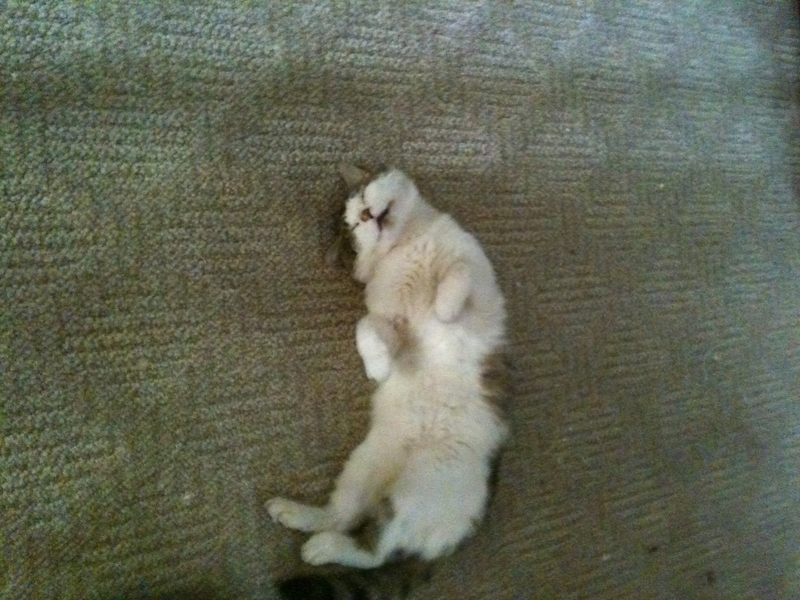 Even the kitty was tired, and he didn’t help at all. good for you guys! there is not another couple on earth that deserves this farm as much as you two, nor another couple who will do it as much justice. When do we get to hear about the mole?